This week the nursery is starting to come alive with foliage and flower color! Evening Star Superbells is a mounding type of Million Bells that has a wonderful color combo of purple and yellow. I have been very impressed by the “Punch” series of Superbells that I think the “Star” series will do just as well. This annual is great for spilling out of pots with blooms all summer long. You also don’t have to trim them unless you have a water oops. Just remember to water and fertilize regularly. Great for planters in all day sunny spots. The Scarlet Storm Quince aka Double Take Scarlet is a thornless, fruitless quince that in April gives you these wonderfully deep red blooms. They grow to about 4 to 5 feet tall and wide. Quince due well in as little as 4 hours of sun to all day sun. The red covers the branches of last year growth, so don’t prune them until after the annual show to maintain size. This week’s featured plants shine bright all winter long providing color when there is not. Both of these handle full hot sun! Winter Sun Pine is a type of mugo that reaches 6 feet tall and 4 feet wide. In the warmer months it’s a standard pine green but come winter it’s an electric yellow. It’s very cold hardy and tough to handle our hot summers. Winter Sun Pine works well for along a fence or house corner for a winter focal point. This would work well with redtwig dogwoods, or blue spruces for winter interest. Golden Sword Yucca are great for hot sunny spots. They get 3 to 4 feet tall and 5 feet wide. White bell shaped flowers appear in the late spring. The yellow variegated blades pair well with russian sage, lavender, ornamental grasses, red barberry or mugo pines. The Golden Ruby Barberry is a dwarf barberry with coral orange foliage. It gets two feet tall and wide without trying to be rangy like it’s fellow cousins. Golden Ruby can handle being in sun or shade spots but it’s color is best when it gets at least 6 hours of sun. I like to use it for a border plant to contrast perennials and larger shrubs. It also fits in tight spots that are now wider than 3 feet. Gold Finger Potentilla is an old favorite for places that have lots of heat, sun and not the best soils. Gold Finger keeps to about 3 feet tall and wide. Flowers in summer with deep yellow blooms. Though it can get rangy over time, these plants can handle a lot of and are easy to care for. I like to use these in desert landscapes or less formal design that needs something colorful and tough. To keep them from getting rangy I like to prune them hard every three years to encourage new branching in late Feb/March. Potentillas play nice with perennial salvia and lavenders. I wanted to share the two most popular plants that we took to Regional Home and Garden Show. The Pink Dawn Viburnum is one of the best “Welcome Spring” plants there are on the market. For it is a tough plant that can take full sun to part shade, handle wind and our cold temperatures. Pink Dawn Viburnum grows to 8 to 10 feet tall and 6 to 8 feet wide. In late winter to early spring it flowers fragrant soft pink blooms. They almost remind one of lilacs. In fall, their green leaves turn to a rusty red. I like to use this plant as a height and surrounded by summer flowering perennials. You can also use it for privacy screening by a patio to take advantage of the fragrance. The Blue Short Needle Japanese White Pine attracted people at the Home Show because of it’s blue-green foliage and irregular shape. It grows to 20 feet tall and 15 feet wide. It doesn’t grow fast which allows it to be used in smaller spots that can’t have full size pine growing there. They enjoy full sun to part shade conditions and enjoy well drained soils. It would work great to serve as a backdrop to perennials and shrubs while providing year round interest. The Ivory Halo Dogwood is a great plant for winter interest whether it’s snowy or not; with it’s bright red stems. They grow to about 6 feet tall and wide. You can keep them in check with shearing if the space doesn't allow for it. Ivory Halo works well in full sun, as long as it gets plenty of water. The leaves during the growing season are medium green with white edges. This allows it to contrast plants like roses, pines, ninebarks and weigela. It can handle a wide range of soil conditions from being on a drip system to being on a river bank with saturated soil. Ivory Halo is great for parts of the yard that are always wet. Ivory Halo would be glad to take up the water. It’s so fuzzy! The Tiger Eyes Sumac is a yard friendly cutleaf sumac that looks like antlers in the winter; including having the velvet. It reaches 6 feet tall and wide. Tiger eyes leafs out in the spring with yellow to chartreuse green leaves. It's shape and texture resembles a Japanese Maples; but Tiger Eyes enjoys our hot summers. The only complaint that is tries to colonize but if you pull up the suckers keeps it in check. Enjoy the fall colors of oranges and red for a grand finale to the growing season. Yellow Trumpet Vine is great for when you need yellow summer flowers that attract pollinators. The Trumpet Vine is aggressive so it does need to be kept in check with frequent trimming. Yet, if you need a narrow privacy screen this one works for it provides a thick foliage screen. It enjoys full sun and likes water. Don’t give it too much nitrogen to help keep it in check. Otherwise enjoy the flowers in the summer time. This week features plants that show well on cloudy winter days! We even took these photos on a cloudy day to show off their glow. Goshiki False Holly is a medium shrub for afternoon shade spots. It grows 3 to 5 feet tall and wide. The leaves emerge pink, then tune green with splashes of yellow. Goshiki prefers well drained soils so it will go well with azaleas, rhododendrons and astilbes. It works great in small areas and can be trimmed easily to keep in check. Chollipo Euonymus is a sun loving yellow variegated plant that grows to 12 feet tall and 6 feet wide. It can be used where you need a vertical height and for darker spaces. Chollipo can handle part shade to full sun spots. Like the Goshiki it prefers well drained soil, to be regularly watered and fertilized. Also trim to keep it in bounds if needed. 5 Newer Flowering Shrubs that Alex Really Likes! Here are 5 newer shrubs that have been introduced in the last couple of years that I have found to be: exciting, easy to care for, perform well in our area and will be in inventory this spring. Purple Pillar Rose of Sharon-Purple Pillar is a columnar Rose of Sharon that only gets to 2 to 3 feet wide. Blooms purple with red centers from July to September. It enjoys full sun and heat for best bloom performance. Purple Pillar works well on corner of houses, narrow beds that need height between windows, or for hedge plant to add color to an evergreen hedge. Diamond Rouge Hydrangea-Diamond Rouge is a sun loving Hydrangea that blooms white and turns to raspberry pink earlier and doesn’t depend on temp to trigger the color change. It also has a nice upright habit and is less prone to flopping over while in bloom like previous varieties which means less pruning needed. They grow to about 4 to 5 feet tall and 3 to 4 feet wide. Another bonus is the red fall color it turns in October. Fireside Ninebark-Fireside Ninebark is a dwarf ninebark that features the rich red purple foliage but keeps a more compact form of 5 to 7’ tall and wide. The foliage has the appealing larger leaf of Diabolo that grows to twice the size of Fireside. It enjoys part sun to full sun spots, and doesn’t mind our winds. Works well as a hedge for privacy or where you need a color contrast against a fence or flower bed. Ninebarks are also thorn-less. 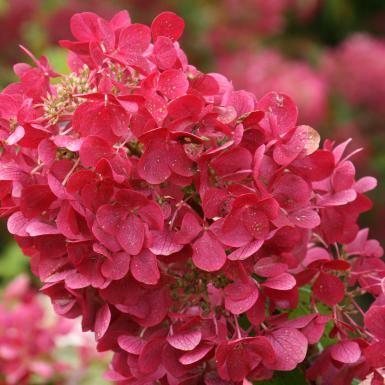 Fire Island Hydrangea- Fire Island Hydrangea is great for afternoon shade areas of the yard. It is a dwarf Hydrangea that only grows to about 3.5 feet tall and wide. It starts blooming in early summer and goes into fall for it blooms on both new and old wood. So you get blooms no matter how hard a winter is on the plant. The pink/white colors of the bloom shows nicely in shade. Lil’ Flirt Spirea -Lil’ Flirt Spirea is a tiny Spirea that is just as durable as it’s bigger cousins. It grows in pretty much any soil condition to 2 1/2 feet tall and wide. It enjoys partial to all sun as well. Lil’ Flirt stays compact and starts blooming in May with repeat blooms throughout the summer. More so if you shear off the old blooms periodically. 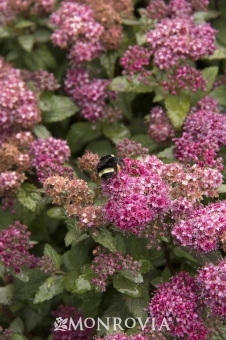 The compact habit lends this Spirea to work well in perennial beds or as a border plant. The Weeping Norway Spruce is a classic, durable weeping evergreen for the Tri-Cities. It handles full sun to part shade, our range of temps from summer to winter and our soils with ease. The Weeping Norway Spruce is also flexible to how you train it. You can twist it, train it upward, or let it creep along the ground. The versatility is endless. It’s mature spread is 6 to 10 feet. The Fiji Rose of Sharon is for full sun spots and has a long bloom season. The pink/white blend stands out well whether it’s a sunny day or in moonlight. This plant is available as a shrub for privacy or accent as well as a small “tree” for focal points. It grows to about 10 to 12 feet tall and six feet wide. The more sun it gets the better for it needs heat to bloom like it’s cousin the dinner plate Hibiscus. Keep it well fed and hydrated so Fiji won’t disappoint. Angel Falls White Pine is a weeping pine with blue green foliage. It’s needles are soft to the touch versus the spiny feel of the Austrian Pines. The blue green foliage lends itself to contrasting red, dark green, or yellow leafed plants. The Angel Falls mature size depends on how tall you train it. 12 to 15 feet would be the tallest it grows upward if trained. Training Angel Falls upright is simple, you tie it to a bamboo stake, move the stake upward and retie as needed. The flexibility of training the plant lends itself well to focal points near the corner of the house, blank walls or corner where something tall is needed. Angel Falls prefers at least 6 hours of sunlight. Whipcord Western Red Cedar is a dark green mop-head evergreen. This one is just cool when put in the yard. It breaks away from the standard upright globe shaped plants. The dark green plays well with different shrubs and perennials. It also enjoys full sun (at least six hours) and moist but well drained soils. Whipcord grows to about 4 to 5 feet tall and wide. The Variegated Alaskan Cedar is an evergreen tree that gives a yard texture, height accents, or just a good block. The foliage is dark green with a smattering of yellow needles. This tree grows to about 20 to 30 feet tall and 12 to 15 feet wide, making it a small tree. They can handle fun sun, though strong winds when it’s over 90 can lightly burn the yellow. Onyx Flamingo Hydrangea is a type of big leaf hydrangea that loves afternoon shade in our hot summers. The pale pink bloom clusters is striking when compared to both the black stems and the dark green foliage. It grows to 3 to 4 feet tall and wide. It also blooms on new and old wood, so now matter how bad winter is, you will still have blooms. If you would like a pale blue version of this, just treat the soil with sulfur, G&B Acid Planting Mix or Aluminum Sulfate to acidify the soil. The Carnival Watermelon Coralbells are great border plants for Tri-City shade gardens. They can play well with Hostas and contrast well with Hydrangeas. Carnival Watermelon reaches 12 inches tall and 2 feet wide. The foliage ranges from a frosted peach to a copper purple. It’s does best with afternoon shade in the Mid Columbia because they don’t enjoy getting dry. In mild winters it is an evergreen as well. The Autumn Brilliance Serviceberry is a large growing shrub or small tree. It has with spectacular fall color with reds and oranges. They grow to about 20 to 25 feet tall and wide. In the spring they flower white. In summer develop purple black berries that are great for bird habitat. You can also make jams and jellies with them. Autumn Brilliance works great to provide a screen when in shrub form. Or as a small shaped tree with irregular branching. Handles full sun to part shade conditions. The Blue Muffin Viburnum is a tall shrub (5 to 7 feet tall and wide) for partial shade to full sun. It has white flowers in the spring and blue berries that appear in summer to feed birds. The most striking surprise this shrub has is it's fall color. The fall colors range from fire engine red to burgundy. It is also deer resistant and very cold hardy (USDA zone 3). October Daphne Sedum is a hardy succulent that enjoys sunny hot spots in the yard. It can also enjoy drier spots too. The blue gray foliage reaches about 6 to 12 inches tall and spreads to 24 inches wide. In late summer it flowers the pink flower pictured above that attract butterflies. The Dwarf Fothergilla is a small sized shrub that has exquisite fall color! It is a slow growing plant that reaches 2 to 3 feet tall and 3 to 4 feet wide. Green in the summer time and in spring it has fragrant white flowers that remind me of a bottle brush. Forthergilla grows well in full sun to partial shade (4 or more hours a day). The Kwanzan Cherry is a flowering cherry tree that grows to 30 feet tall and 20 feet wide. Most known for it’s double pink blooms in the spring, it has a surprising nice fall color. The yellow and oranges contrast with red fall color like maples, burning bushes or fothergilla really well. Prefers full sun but does best not being next to sidewalks and streets for they don’t like the reflected heat on their trunks. The Gold Flame Spiraea is stunning in the fall with a nice bright red fall color. It grows to about 3 to 4 feet tall and wide. Gold Flame handles full sun to part shade as well as being versatile in many landscape areas. In the summer it has a gold/green and has pink flowers in the late spring and summer. Golden Colonnade Ginkgo is a ginkgo with a strong central leader. Unlike other ginkgos that enjoy being naturally free form. It matures to 45 feet tall and 25 feet wide. Ginkgos do well in the Tri-Cities and are very durable. The fall color is a brilliant golden yellow like the ginkgos on Haines St in Richland. Except Golden Colonnade are male, so no stinky fruit! Berry White Hydrangea is a sun loving Hydrangea with red fall color! It reaches 6 to 7 feet tall and 4 to 5 feet wide. In July it flowers white and ages to pink. Berry White also stays upright more so than Vanilla Strawberry. Like other paniculata Hydrangeas it enjoys full to partial sun (4 or more hours of sun). Fireside Ninebark is a new dark leafed ninebark that has bigger leaves compared to other dwarf ninebark. It grows to about 5 to 7 feet all and 4 to 6 feet wide. A great option for where you need a dark foliage color without the thorns of barberry. In the May it flowers pink/white flower clusters. Can be used as a hedge or as a focal point. Best to be planted in full sun (at least six hours). The Mini Twists Pine is dwarf eastern white pine with twisted needles for a cool effect year round. It reaches 6 ft x 4 ft wide. Like full sun to partial shade conditions. It is great for a garden that needs a durable year round effect without the size of other pines. Redpointe Maple is a newer red maple that is yard friendly reaching 45 feet tall and 30 feet wide. It has a great red fall color. Redpointe is not fussy when it comes to soil pH like Brandywine or October Glory can be in sandy soils. Redpointe continues to retain a nice green summer color and fall color performance. It still needs to be fed regularly for optimal growth performance. It’s a quick grower and has some small helicopters. A very clean tree when it comes to maples.